We also know the next battletome will be for Fyreslayers, and there is something called Looncurse coming, which I’m guessing will be a battle box of Sylvaneth vs Gloomspite Gitz. Flowers vs Fungus? Not sure what else it could mean. But anyway, we’ll see what’s in store there! The next warband for Warhammer Underworlds has been shown off as the Kharadron Overlords, at which point I’m not sure if there are any more to be seen in this season of the game? After all, that teaser from a while back which seemed to show off the line-up for the year, the sky-dwarves were the last on the list, but there could be more surprises, of course! 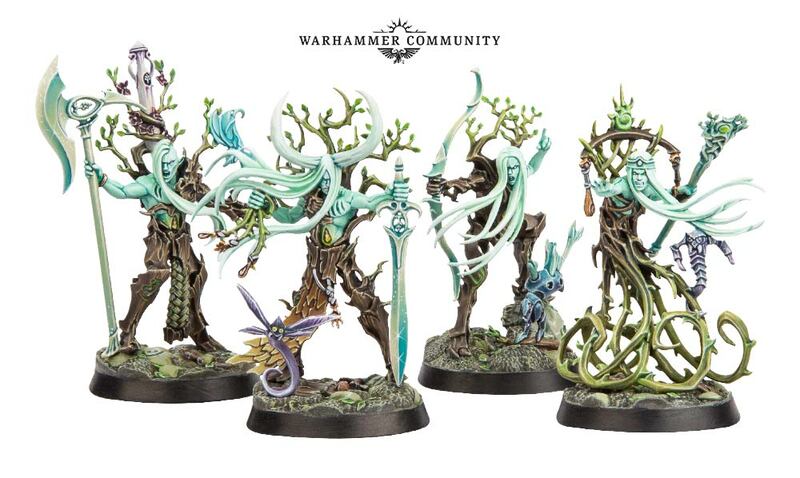 Between these and the Sylvaneth warband we’ve also seen now, though, I suppose that could well take us to a third box coming out for the autumn period? The first big bit of news for me in the announcement was more info on Warcry. 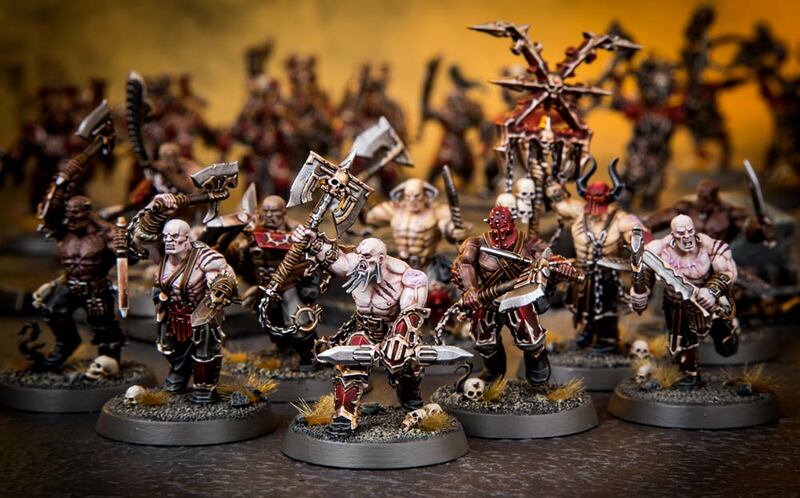 I’m really looking forward to this game, even if my bank balance isn’t, because I love the look of the new Chaos models we’ve been seeing! The Iron Golems are a fascinating look at Chaos in all its myriad forms, with some truly awesome looking miniatures that I can’t wait to get my hands on and start painting! I mean, this huge dude with the weapon-arms looks splendid! And I love the guy slinging the chain-thing in the trailer above! 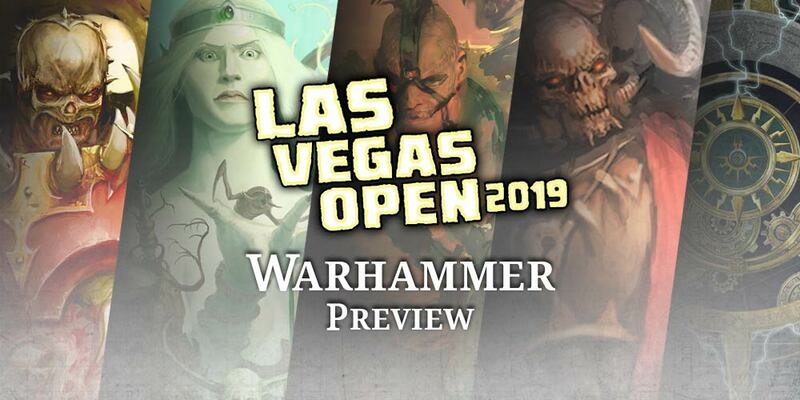 There will be 9 non-Chaos warbands to play in the game, which will hopefully alleviate some of the naysayers online who have been making their opinions known. I’m really looking forward to this, because it looks like we’ll be able to play some really eclectic forces from the looks of these new minis alone. Looking forward to the summer for this one, definitely! 40k now, and we’re going huge with a new rules system for Apocalypse games. Looks like GW have come a long way since they included the rules for this back in Chapter Approved 2017! I’ve only ever been tangentially interested in games that take an entire day (takes me back to playing during 7th edition, when 1000-point games took me several hours). However, if it’s what people want, then it should be great to see huge battles once again! There wasn’t a great deal of 40k news, though under the alarming heading “the future of 40k” we have an idea of where we’re going next – basically, it looks like campaign systems like the current Vigilus one will become the norm, moving to different planets and seeing what’s going on there. 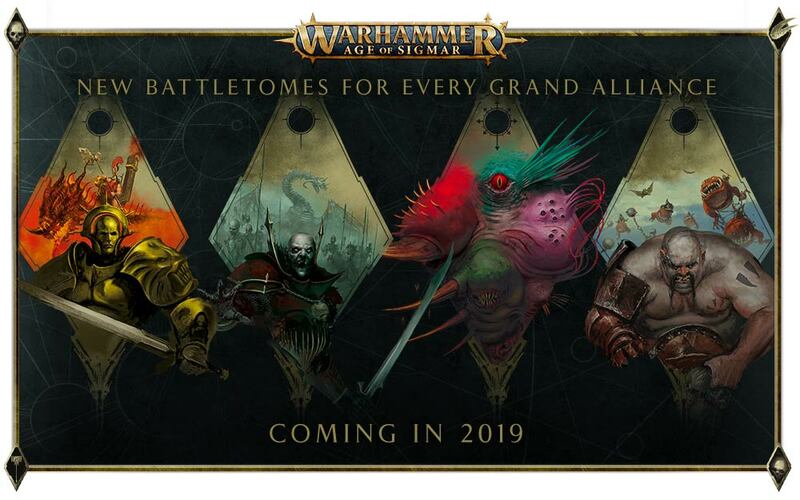 Seems like new model releases like Marneus Calgar and Abaddon will be made in the context of this new campaign system, and I think it’s not only a bit obvious, but also could lead to some really great stuff, so I can’t wait to see what’s next in store for us here! Yes, that’s right – Slaanesh is not buried and forgotten by GW! It may seem inevitable now, but there were some dark days during 2015/16 when we thought Slaanesh might be quietly removed from the Chaos pantheon in an effort to make the model range more PG13 friendly. Well, forget about that, and feast your eyes on this new Keeper of Secrets, baby! This thing looks incredible, and I cannot wait to get my hands on it. I must be honest here, I’ve recently been waning again with my ideas of a multifarious Chaos army, and instead going down the Khorne route. However, I think a part of me will always be devoted to the Dark Prince, and I will most assuredly be getting my act together with painting some of these things when the time comes! I mean, this thing looks amazing! 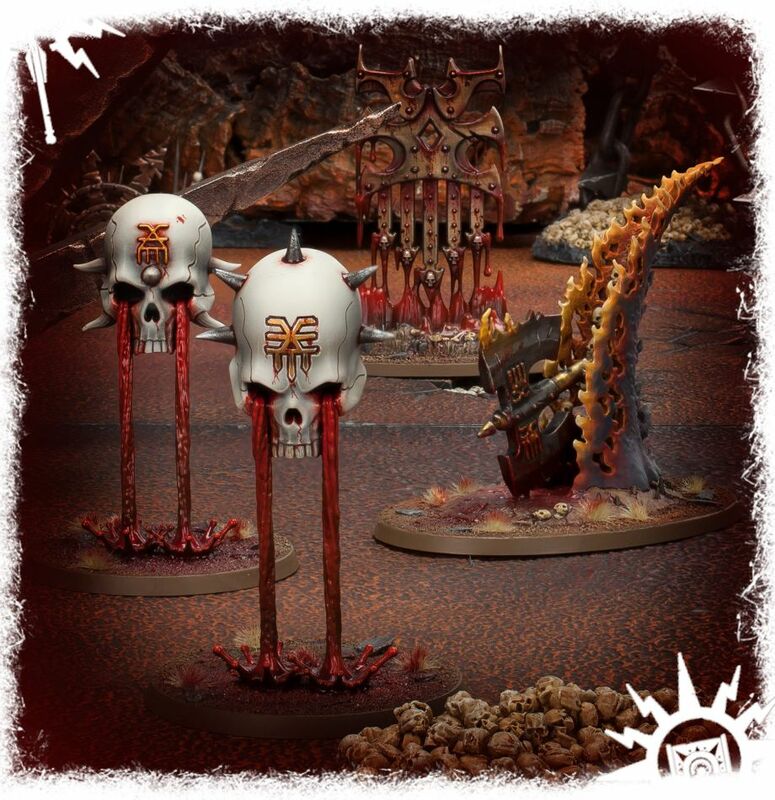 Naturally, it’s a new Battletome for the Prince of Pleasure, and so we’re also getting a new terrain piece and new Endless Spells, which looks suitably weird and wonderful! I’m also hoping we’ll be getting the Slaanesh side of Wrath and Rapture released separately as well, as I want that harpist herald! There is a lot for Age of Sigmar here, isn’t there? 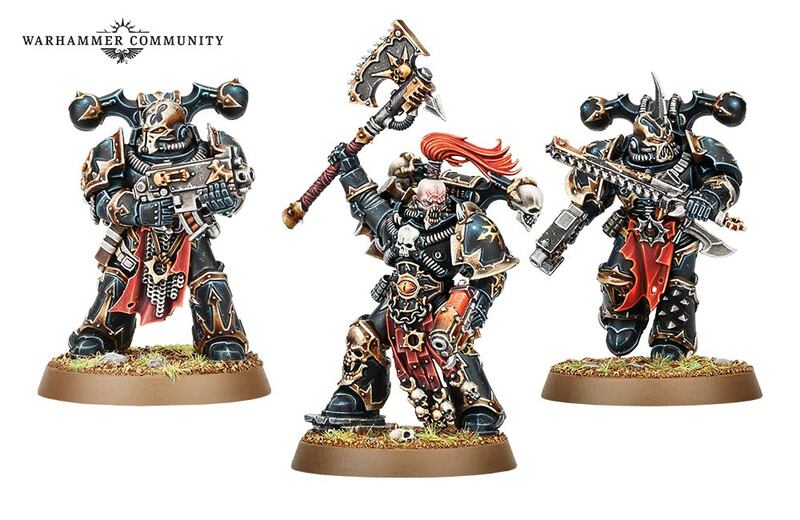 I suppose the new Chaos Space Marines release, and all the shenanigans around Vigilus we’ve been experiencing since well before Christmas have perhaps taken a toll, and it’s high time we did return to the Mortal Realms for a bit. Of course, the Slaanesh stuff will be equally usable on both sides of the fence, but there was a part of me that was a little bit concerned as to whether we’d be seeing a drop-off of 40k stuff this year until the Sisters release. Well, I suppose I could stand to save up a little bit, after all, so I can’t really complain! Between the new miniatures for Warcry, and the new plastic Slaanesh stuff, we’re really living in a fantastic time for model design and implementation, and it just gets better year after year. It’s the GAMA Trade Show 2019! It’s the GAMA Trade Show, and as I have done in the past, I’ll be keeping an eye on the proceedings to see what we’ve got to look forward to in the coming weeks and months! We’re getting all manner of delights here, from terminators (as we can see on the cover) to Drukhari Grotesques! It was almost prescient of me, then, to have just bought a pair of these delights! For all my cynicism of expanding the game like this, I am actually looking forward to seeing how it continues to grow – the danger, of course, being that it will soon turn into just low-point 40k if it isn’t careful. But so long as we continue to get intelligent choices with reasonable rules behind them, why not, right? Just let me take Lychguard now! I suppose this also answers the question, where has the Thousand Sons faction box been? Along with a Kal Jerico model for Necromunda, we’re also getting a Halfling team for Blood Bowl, with promises of more announcements to come in the next couple of days! …let’s see what else is on offer!! Next generation of the DC Deck Building Game, with the Rebirth branding? Very cool. Not sure about the more board-gamey aspect with moving cardboard chits around – it is supposed to be a deck building game, after all – but linked campaign scenarios and character progression do sound like they should be a lot of fun. Gonna keep my eye on this one! 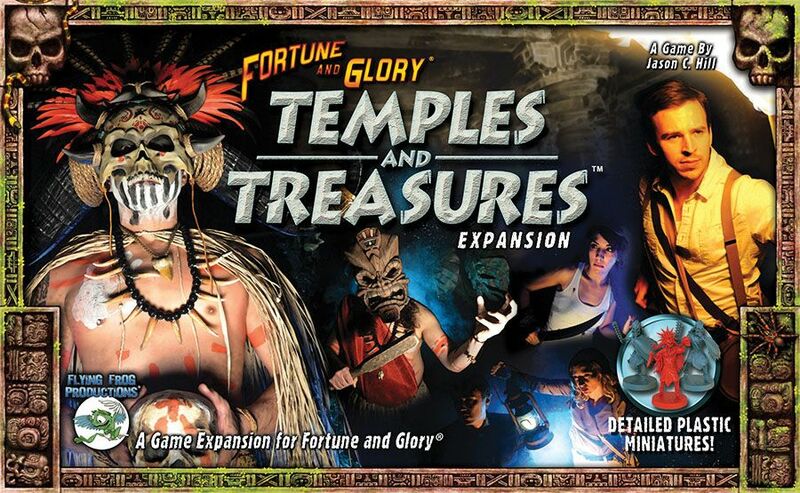 You know, I’d forgotten about the two Fortune & Glory expansions until reviewing last year’s GAMA blog, but now that I’ve had my memory jogged, I really feel the need to have them in my life! It feels like Shadows of Brimstone has taken over Flying Frog, and with the third kickstarter for this game currently ongoing, I have to wonder if they have their sights set anywhere near the more traditional games manufacturing route. Not that I’m trying to be bitter or anything, but I do miss their games like Fortune & Glory, and A Touch of Evil. Last year, they were in the middle of making sure the Forbidden Fortress SOBS game was shipped in time, pushing the FANG expansions back to the first quarter of 2019. Well, we’ll just have to wait patiently for something not weird-west related to arrive, I guess! 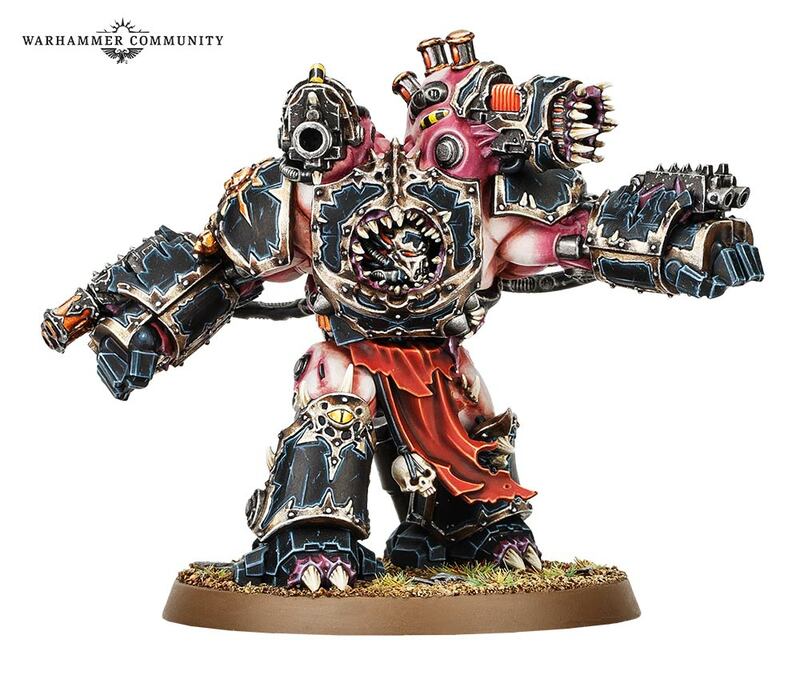 I’ve said it before, of course, but I really love how GW are using Blackstone Fortress to explore these weird and wonderful bits of the 40k universe. 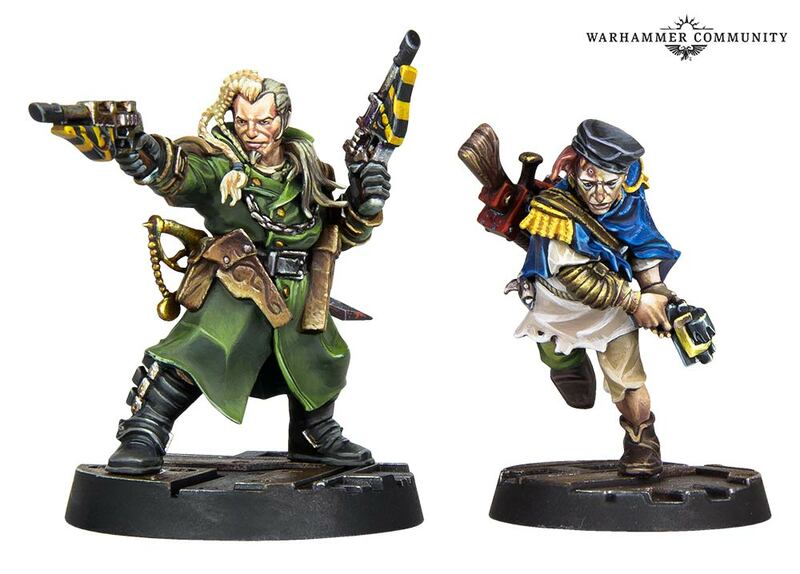 The Commissar in particular looks like a stunning chap, I’m really looking forward to snapping these up when they’re out! Warcry, the skirmish game set in the AoS universe and first teased a few months back now, has finally been shown off to be really quite the interesting game! Pitting different Chaos warbands against one another, at first it sounded like it might be a bit too exclusive – I mean, what about us Death players, right? But whether Chaos is just the first wave or not, it’s difficult to not be enamoured with at least one of these factions, particularly the cute looking devil-bats! 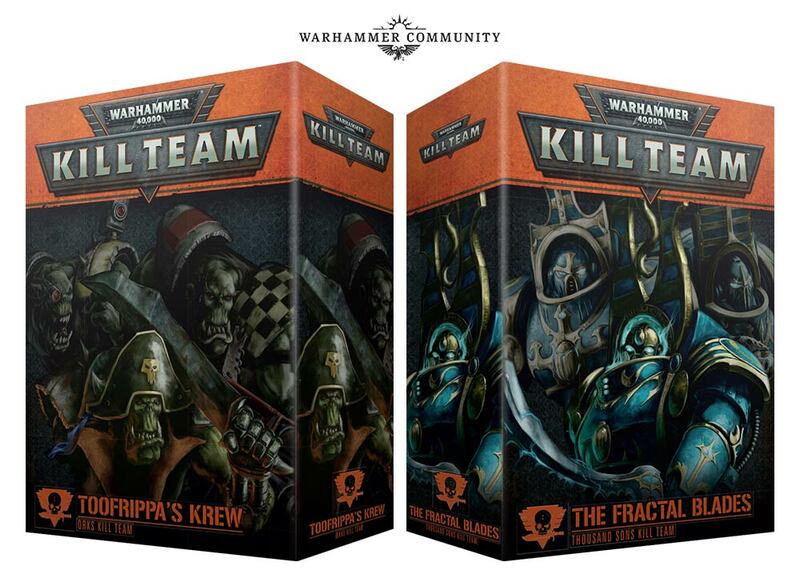 I like it, which I’m a bit sorry about, as I feel like it might well become another juggernaut like Kill Team, and I’m not sure my bank balance can cope with that! 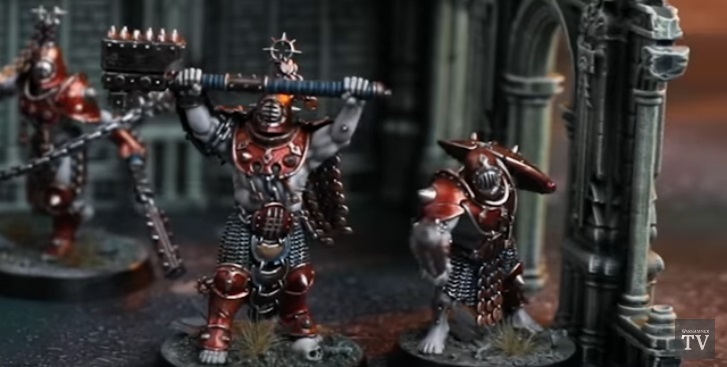 I really like the look of those pit-fighters with the welding masks, they remind me of Haemonculus Covens creations among the Drukhari, and I’m sure plenty of us will be using them for Grotesque conversions as these things move along. The scenery looks pretty amazing, too! 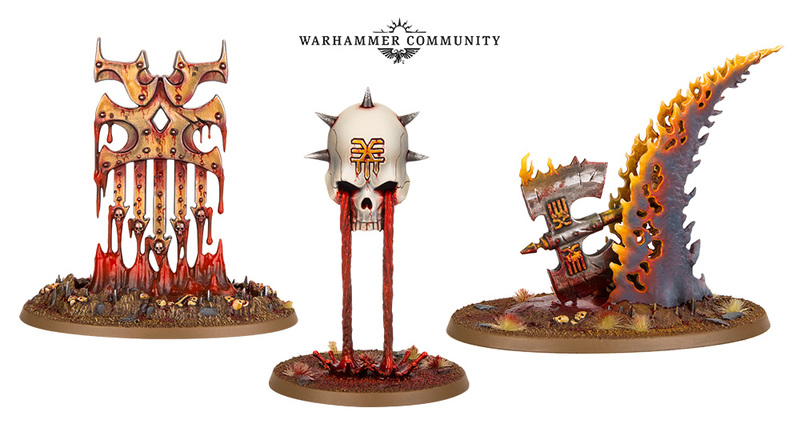 Not sure, of course, but this could tie in with the rumours of Warriors of Chaos/Slaves to Darkness getting an overhaul soon. I suppose we’ll see! It almost feels like the landscape of boardgame news has changed, and the big trade shows are no longer that important for getting a picture of what’s coming up next. Even the big daddy of them all, GenCon, hasn’t been that explosive for the last year or two. 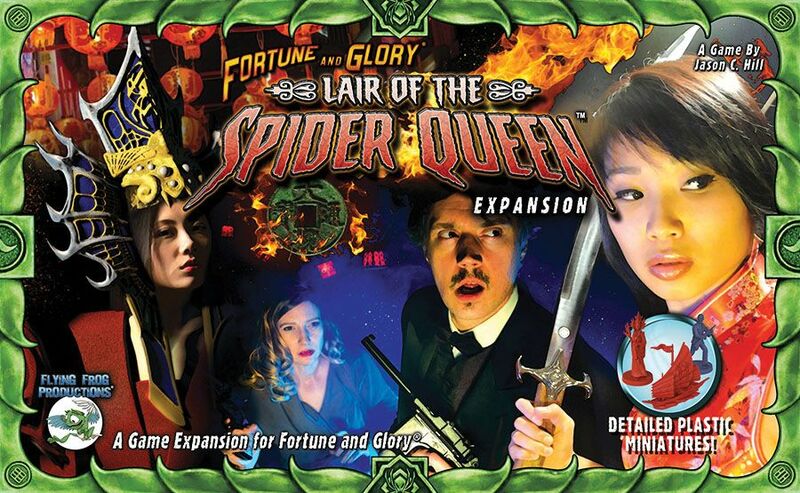 Is it a result of Kickstarter seemingly taking over the world of boardgame production? Speaking from an entirely personal perspective, it seems like the companies I used to watch – FFG in particular here – just aren’t knocking it out of the park anymore, with nothing really overwhelming me with its excitement. Meanwhile, established companies like Cryptozoic and Flying Frog Productions seem to be using Kickstarter more like their business model than not, and it’s leading to an over-saturation of stuff. 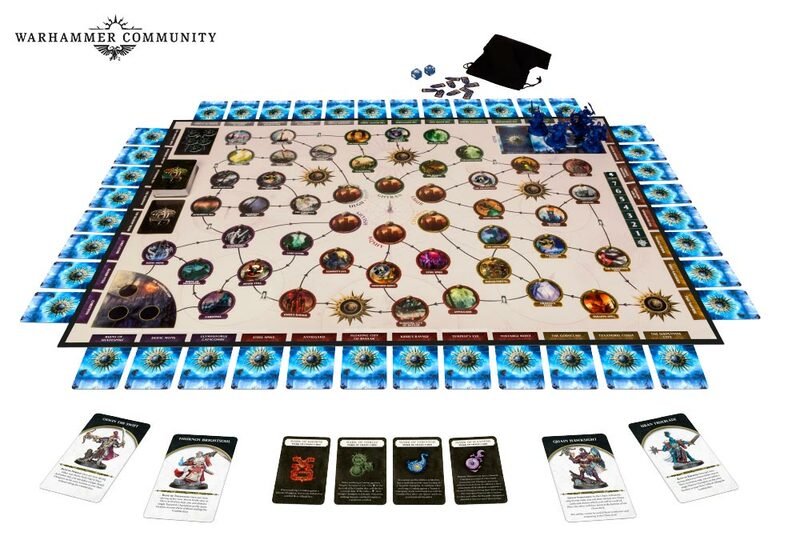 Shadows of Brimstone has been a case in point here – when that stuff eventually found its way to me, it was like receiving 5+ years’ worth of expansion material in one hit, and I’m not sure I want that from a board game. Has our modern sense of impatience and always wanting the next thing caught up with us, to the point where we suddenly need everything for a game right now? All of these companies using Kickstarter to distribute games, and somewhat by necessity producing almost an entire game’s run in one go just to ensure the crowdfunding, seems to have led to a point where they just don’t have anything new to announce, because we had it all in one hit a year or two ago. 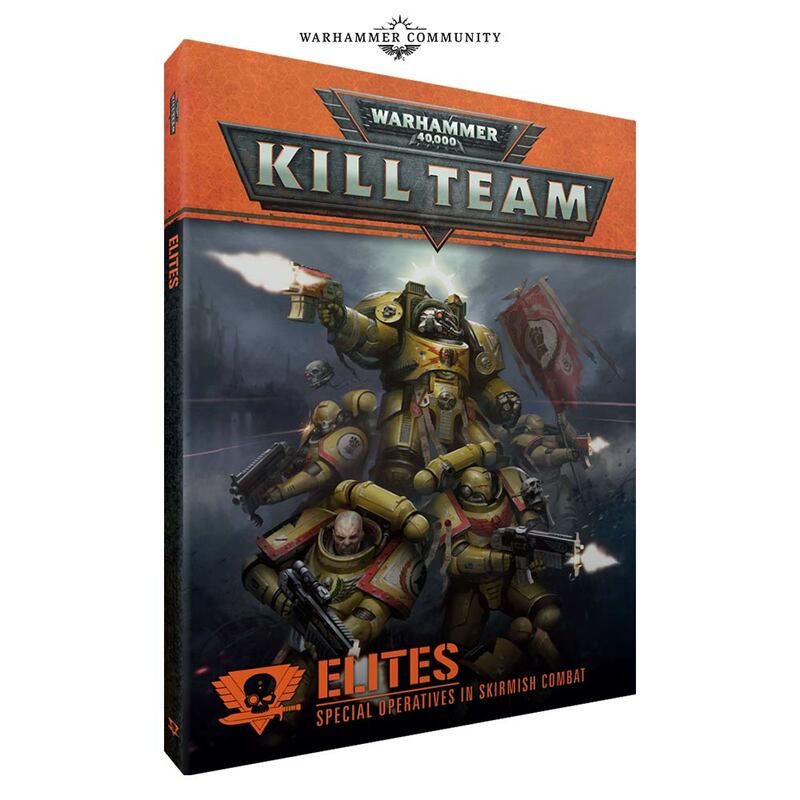 Author spalanzPosted on March 11, 2019 March 13, 2019 Categories board gamesTags Age of Sigmar, Blackstone Fortress, Cryptozoic, DC deck building game, Flying Frog Productions, GAMA 2019, Games Workshop, Kill Team, Necromunda, Warcry, Warhammer 40k1 Comment on It’s the GAMA Trade Show 2019! I had my third game of Age of Sigmar last Monday, again playing against Jak and his Maggotkin list, but this time we’d scaled up to 1500 points, so could go a lot wider with our choices. I think Age of Sigmar definitely lends itself better to larger-scale games, as I could see a lot of the synergies come further to the fore this time around. I’ve used Lady Olynder twice now, and I do really like her both as a model and what she can do. I think I still play her slightly cautiously, as she is a model that really needs to be in the thick of things for a lot of her abilities to work, but she needs to choose her targets carefully. I’d also taken a Tomb Banshee (using the Briar Queen model as a proxy, as the aesthetics are much nicer on her, I feel), but I was unimpressed with her performance so doubt I’ll be using her again. I also used Dreadscythe Harridans for the first time, and purposefully sent them in against the Blightkings thinking their -1 to Hit would negate the exploding 6s, but forgot all about the rule for 2 turns and nearly got decimated. I’d wanted to try out some Spirit Hosts, after having enjoyed the models back when they were first released, but unfortunately found they were really quite poor, being on 5s to Hit. Even with 6 attacks each, they barely did anything all game except die off slowly and painfully! I’d sent them against a horde of Plague Monks, thinking 18 attacks in the first round would be quite decent, but they probably hit no more than three or four times in the entire game. It hasn’t stopped me from buying a second box of them, of course – I’m thinking I’ll just try something else with them next time! Finally for the “new” units, I was using ten Grimghast Reapers, which were a little uninspiring at first, despite buffs from the Knight of Shrouds and Spirit Torment, but I was really pleased when both the Torment and the Guardian of Souls came through for me, and basically resurrected the entire unit in round 4, allowing me to clinch a victory at the last minute! Very nice. So I’ve been enjoying the Nighthaunt so far this year, and definitely want to continue on with these ghostly folks as I continue in my Age of Sigmar journey. While I had been branching out a bit with the Idoneth Deepkin and the Beastmen army ideas, I’m now paring everything back, and instead focusing solely on the ghosts. I’ve already sold off the elves, and I will soon be listing the Beastmen on ebay, so that I can instead just focus my energies on building, painting, and then playing games with these to try and really optimise my list and playstyle. Well, that’s the theory, at least! 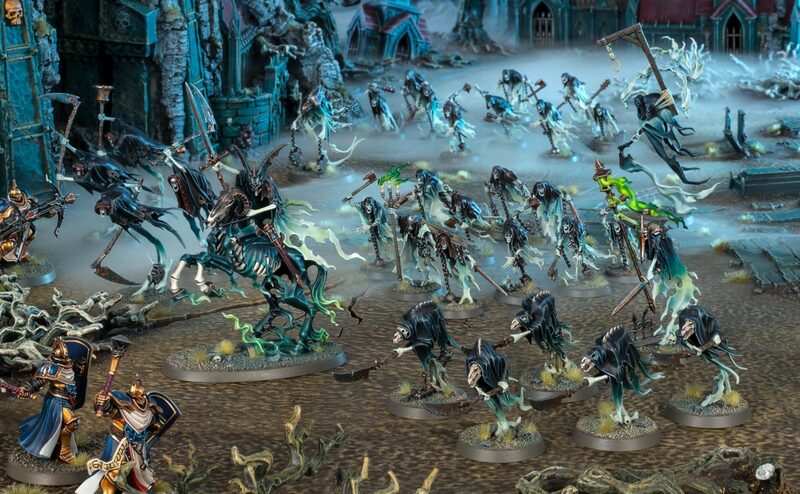 I think the last time I checked in with you all on this, I was considering branching out into Legions of Nagash, and allying-in the Nighthaunt separately. Well, I’ve switched things around now, so that it’s the other way round. While it would be cool to have a bunch of skeletons in the mix as well, I’m mainly playing Nighthaunt, and allying-in Deathlords in order to bring in one of my all-time favourite models, Arkhan the Black! The list is 2000 points, and so is very much a sort of version one of the final destination for me. It makes use of the core army that I have been playing so far this year, but adds in a couple of extra bits and pieces, so that I can get a couple of warscroll battalions in there for the additional command points. I’ve previously talked about feeling a little bit forced into shouldering some battalions into the list in order to generate additional CPs, but honestly, I think it might be the best idea to actually play with these things first and see what sort of things I can do, rather than just dismiss them as a trap on paper alone. So let’s take a look at this list! I like it, which I suppose is the first main point! 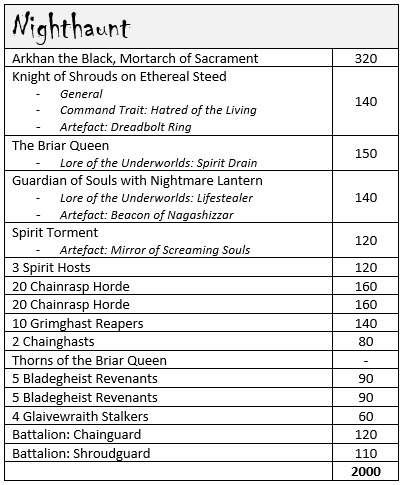 The core of what I was looking to build up to back in January is still there, with the Chainguard and the Shroudguard, but I’ve also tweaked some points to both bring in Arkhan and to allow for more interesting (dare I say, competitive) units to be included. I’ve been able to see how several units have performed already, and I can see that things like the Chainrasp Hordes need to be bigger units to properly bog down the opponent in the mire of close combat. Having an army-wide unrendable save is a huge bonus, and big units like this should survive a lot longer, after all! The Chainghasts and Spirit Torments are going to be handy support units for allowing re-rolls of Hit rolls of 1, while the Spirit Torment’s ability to heal units is a nice fall-back if the Guardian of Souls is off elsewhere. I’m also super excited that I managed to get Thorns of the Briar Queen in here, as I was hoping to field them in an actual Age of Sigmar game back when I first started painting them. So that’s exciting! The Bladegheist Revenants are a new unit for me, as I only actually picked them up last week and have so far built up five of them. Well, I also picked up the 500th Store Anniversary model back in October, which was also a named Bladegheist Revenant, sadly with no rules, but still! They are a bit like a more elite version of the Grimghast Reapers, I think, having similar abilities but a slightly better to Hit stat. 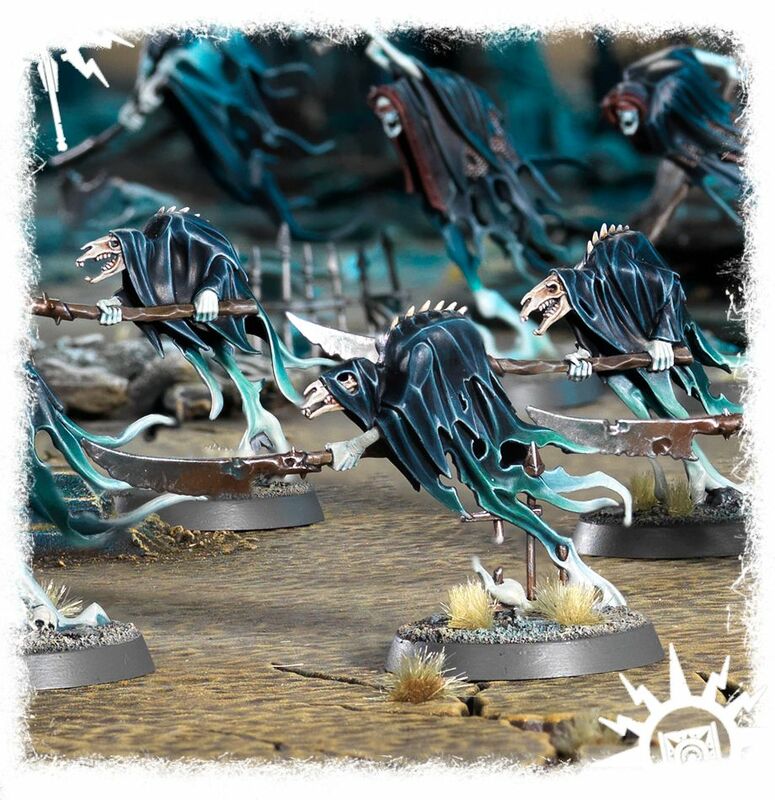 Being able to fall back and charge is always a handy thing, of course, and its an ability they share with the Glaivewraith Stalkers, which will be those from the Easy-to-Build line rather than the Soul Wars box – they get the drummer, who grants them the ability. I’ve not used these chaps yet either, so this will be a little bit of a learning curve, but the only reason I included the Stalkers in the list was due to having the points left over! Artefacts and Command Traits are things I’ve never really bothered with, outside of having the Nightmare Lantern buff for the Guardian of Souls. However, it’s a fun part of the list building that I think I miss from 40k list building, where working out all of the synergies and stuff is part of the enjoyment. It really helped me building this list through the Warscroll Builder on the Community site – other apps are available, of course, but I just wanted to try and get my head around the various moving parts, and this one was really straightforward to use. Having the two battalions in there gives me access to three artefacts, so I could use the Lantern buff while also giving out stuff to the Spirit Torment (dishing out mortal wounds to units within 8″ if a 2D6 roll exceeds the target’s bravery) and Knight of Shrouds (D3 mortal wounds on a target within 3″ if a wound was inflicted through his melee weapon). As the Knight of Shrouds is my General, and isn’t a named character, he can also be given a Command Trait – in this case, I’ve chosen Hatred of the Living, which allows him to re-roll failed Hit rolls with his melee weapons. Hopefully it should be a nice combo with his relic! Spell lores are interesting things, and the Nighthaunt have a couple of pretty decent ones, I think. I’ve given the Briar Queen a spell that can dish out additional mortal wounds – it’s a similar spell to her unique offering, but for a different situation, so hopefully it should make her a flexible caster. The Guardian of Souls will most likely be doing his thing to revive other units, but the addition of an offensive spell should allow him to do more than just sit around being a waste of points if he never has a target for his unique spell. But what about the big cheese himself? Arkhan the Black is just a super cool model, and one that I really can’t wait to include within my army. He should be an amazing centrepiece, as well as having that hilarious Curse of Years spell, which deals out mortal wounds like nobody’s business, he can increase the range of other wizards’ spells by 6″ while they’re within 18″ of him – he also knows all of the spells of other Death wizards within the same range, so he too can attempt to cast Lifestealer or Spirit Drain, or Howling Vortex or Spectral Lure. 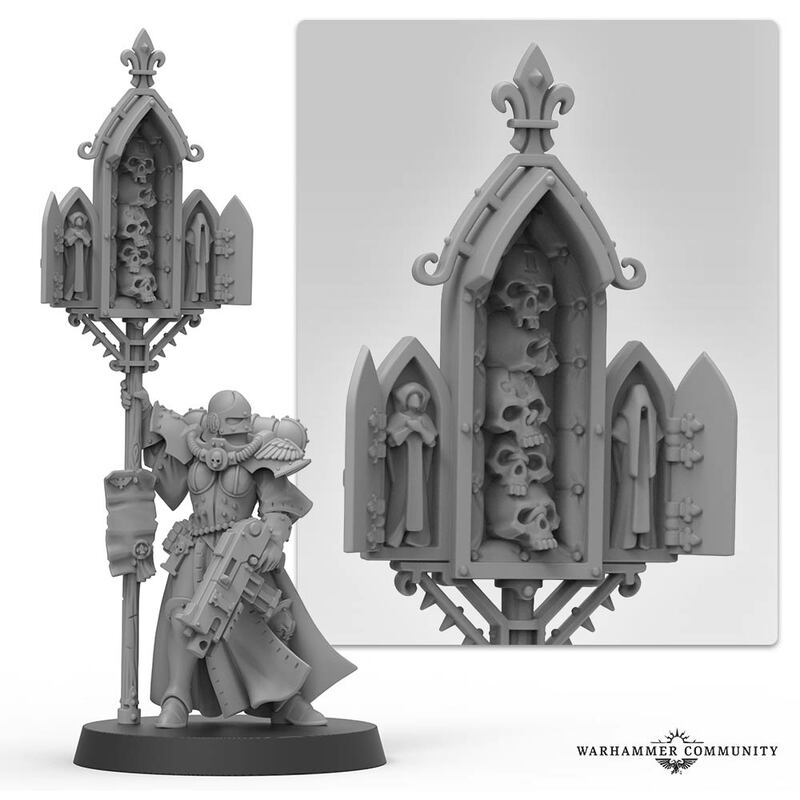 He also has the Deathly Invocation ability that can hopefully heal a bunch of units if he’s positioned right, so he really goes in nicely with the overall theme of the army, perhaps more so than the other original Mortarchs. So yeah, overall I’m really excited to be getting closer to this 2000 point build! 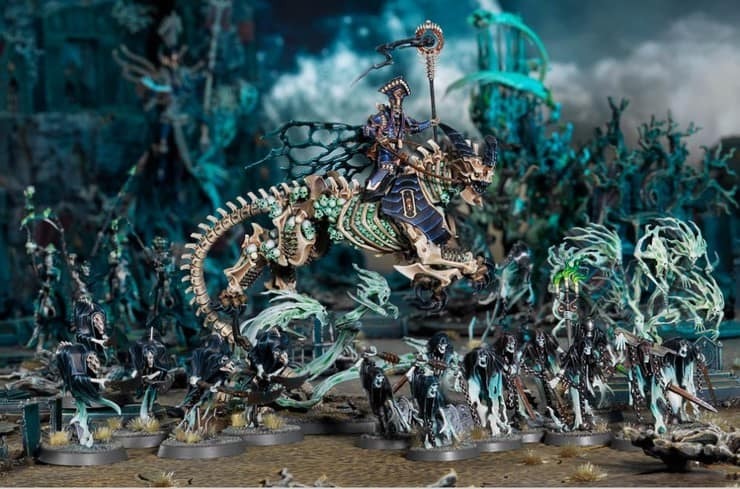 Author spalanzPosted on February 17, 2019 February 16, 2019 Categories WarhammerTags Age of Sigmar, Arkhan the Black, Nagash, Nighthaunt, Soul Wars, WarhammerLeave a comment on Nighthaunt Progress! I’ve still not played Warhammer Underworlds yet, shame on my, but this seems like an interesting take on things. Aimed at new players for the game (so, me) it features what looks like two of the Easy-to-Build kits for Age of Sigmar made into warbands that can be used here with training wheels, and then taken further into the main game. 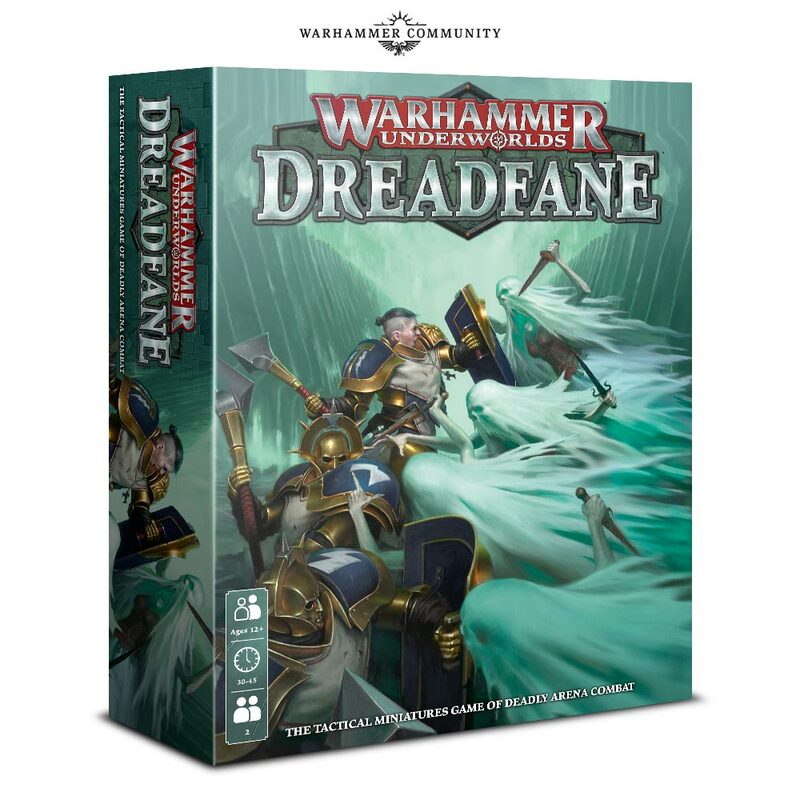 I do love the Nighthaunt, after all, and I am looking to get into Shadespire/Nightvault, so I think this could well be a good buy. I do see the perspective of those players who already have been playing the game, and perhaps begrudge having to get this if there are unique cards that they will no doubt need for more competitive deck builds, but I think all too often we’re bound up with the loud voices here online who decry such enterprises by game companies – all the while, without realising that they just aren’t the majority target audience for this sort of product. 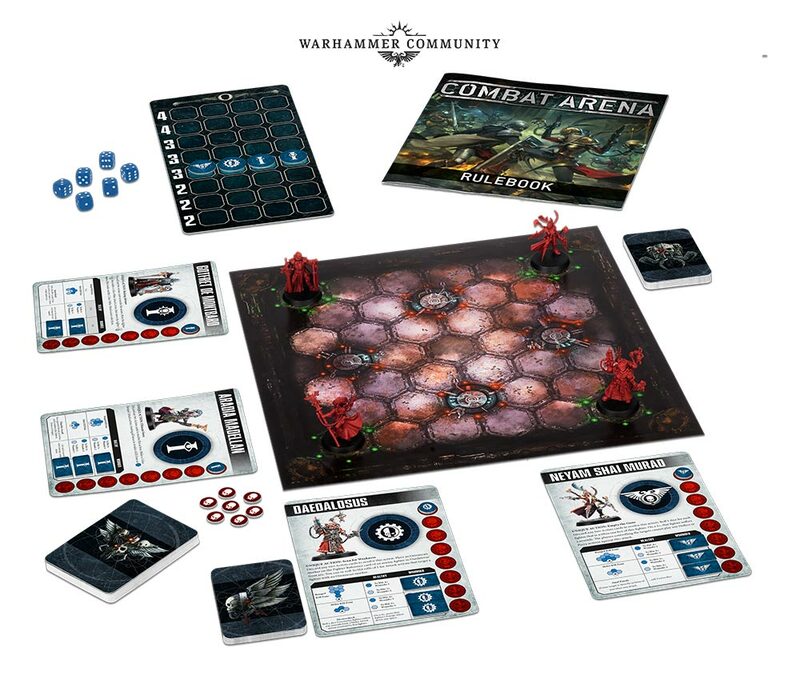 Combat Arena appears to take the principle of Gorechosen and supplants it to the 41st millennium, with generic hero-types being thrust into a pit-fight set aboard a space ship. All of them are Imperium heroes, and so a lot of people seem to be a bit confused as to why such folk would be fighting one another, but there we have it. The game might well be a complete dud, but I’m definitely willing to give it a try. Most importantly, though, the game is bringing to us five new plastic miniatures of iconic figures from Warhammer 40k, from the Primaris Psyker to a third Rogue Trader mini! Apparently, this is a prequel to the Blackstone Fortress game, and these minis will feature in an upcoming adventure pack. What on earth does that even mean? 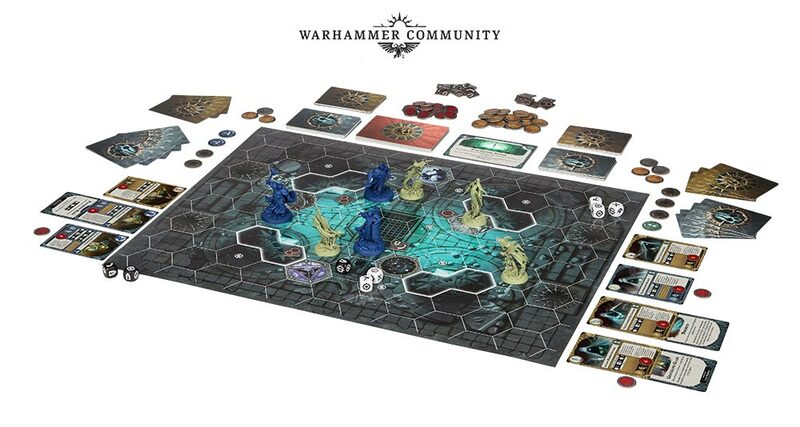 They’re going to be coming out in a Blackstone Fortress-branded box, so we shouldn’t buy this game if we want the minis? 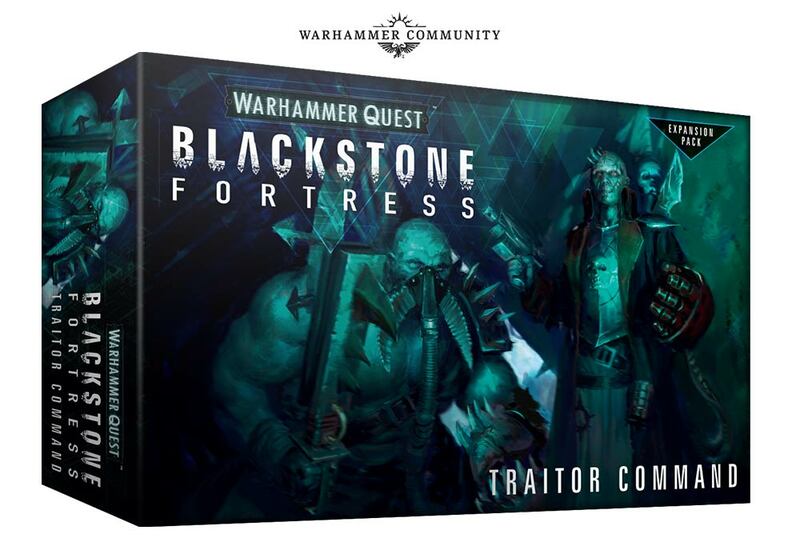 Or will they start to release rules for existing minis to be used in Blackstone Fortress, simply as card packs or whatever? The basing for all of the minis previewed at the event has the same scheme as the other game, so it very much looks like it’s a tie-in, but I’m not sure I quite get it at the moment. Anyway, the minis look fantastic, and I really can’t wait to get them in my collection. 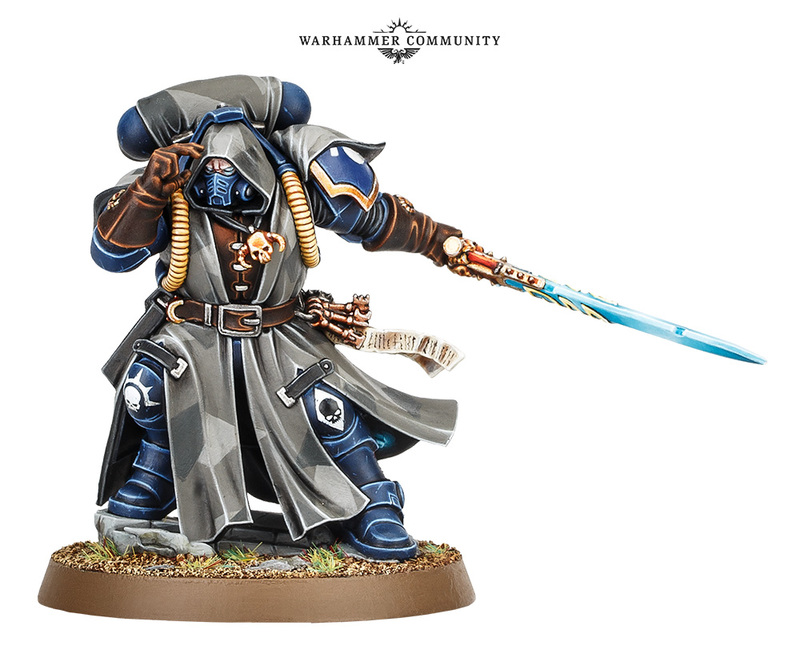 I really appreciate how interesting GW is making their universe through the introduction of new models or re-imagined sculpts for classic models within these sorts of boardgames. I hope we see more stuff like this come out for a long time to come, as we see all manner of weird and wonderful creations for the game. And yes, of course I would like to have rules for 40k included, and maybe even crossover rules for Blackstone Fortress and Kill Team as well. 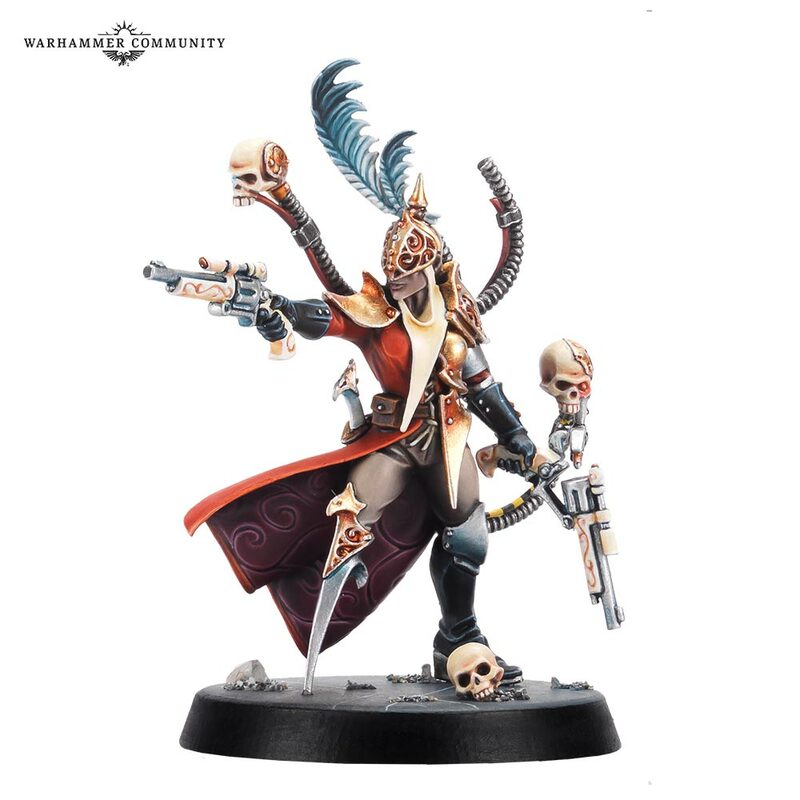 I’ve already been working on building a Chaos force that uses all of the weird stuff from Blackstone Fortress, and I’m still thinking about how to fit the Elucidian Starstriders into an Imperium list – I don’t care if they aren’t competitive, I just love the fact that the lore is being fleshed out on the tabletop, and the more esoteric corners of the 40k universe are being explored in this manner! You know what else I’m really enjoying about this announcement? The fact that we’re seeing Games Workshop actually beginning to realise the promise of their own company name, and produce a whole smorgasbord of games for us to feast upon. When the FFG licence ended, I was a bit disappointed because I have enjoyed their offerings in the board game, card game and RPG formats for a long while. Thinking that GW might only want to concentrate on their big three tabletop wargames, I was anticipating a lack of anything further. But here we are, with a whole slew of new games as well as new takes on the existing games stable, and I think it’s just glorious! Combat Arena or Storm Vault may well be throwaway games that people only buy for the minis and never once look at the game itself – heck, I pretty much did that with Gangs of Commorragh when that came out, though I have still got all of the game material for that one waiting for me to one day take a better look at it. But there are so many games being produced now with incredible new miniatures that they can probably afford to have a couple of duds on the shelf. 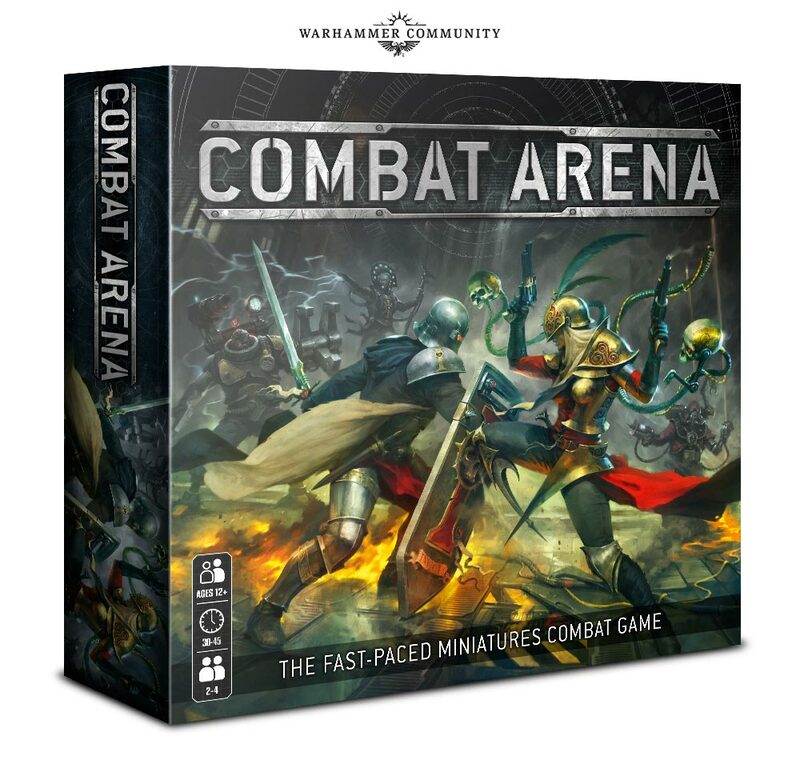 If Combat Arena is only remembered as the place where that sweet new peg-leg Rogue Trader first came out, then that’s fine, because we still have stuff like Warhammer Underworlds, Necromunda, Blackstone Fortress and the like that have been, from all accounts, runaway success stories. But if people are still enjoying Combat Arena years from now, and either clamouring for official rules for Sly Marbo to be written, or playing with fan-made rules for using a Genestealer Patriarch, then that is awesome, too. 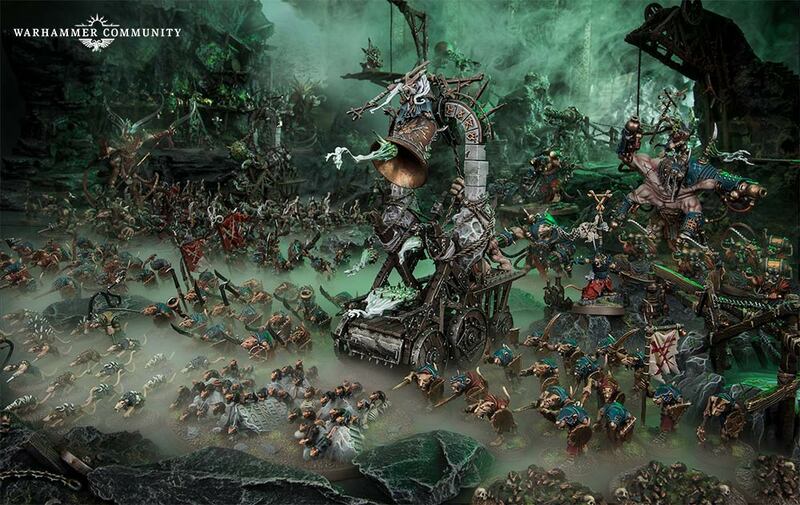 The important thing to take from this, I feel, is that Games Workshop are trying, and I love them for it! 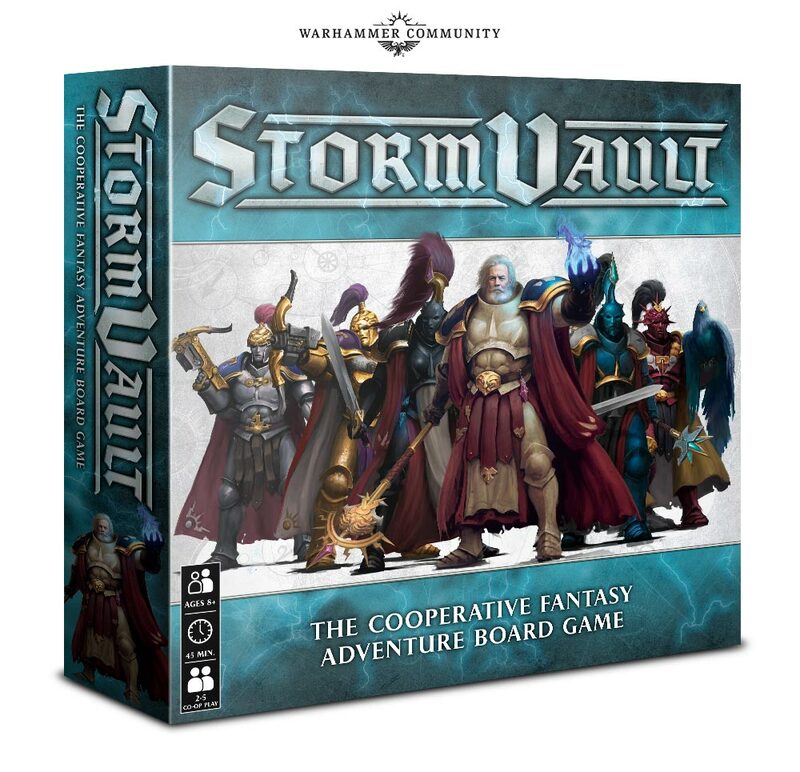 Author spalanzPosted on February 16, 2019 Categories board games, WarhammerTags Age of Sigmar, board games, Combat Arena, Games Workshop, Nightvault, Rogue Trader, Shadespire, Warhammer 40k, Warhammer Underworlds3 Comments on A Workshop of Games! I had a bit of a personal victory today, and I thought I’d share it with you all! As an aside here, how good are the Warhammer TV tutorials? The full ones, I mean – I like the little tips and stuff, don’t get me wrong, but I still enjoy sitting down with a cuppa and watching how they produce the various effects and whatnot. I don’t know if it’s because of the fact they’re the “official” paint guides, or what, but I do like these longer tutorials. Anyway! I was on the cusp of buying my own, but I managed to resist. For possibly the first time ever, I’d been on the cusp of buying something, but had a moment of clarity where I just couldn’t see the need for this model among the rest of my collection, so left it there on the shelf. 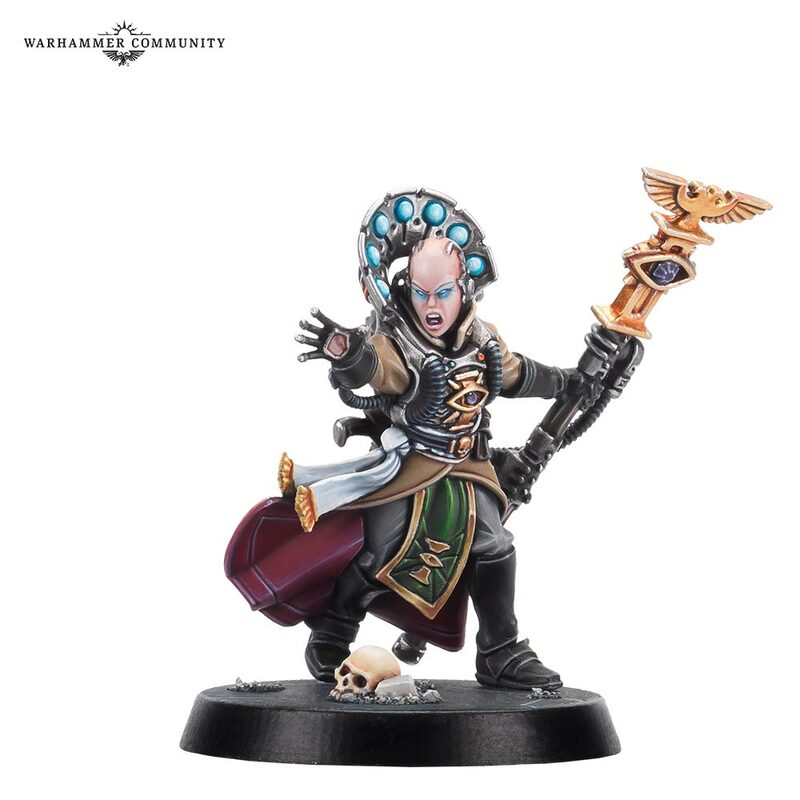 This is perhaps particularly important as we approach the release weekend for the new Genestealer Cults stuff, and I feel my wallet already having little tremors of uncertainty at how much of this stuff I want to buy! 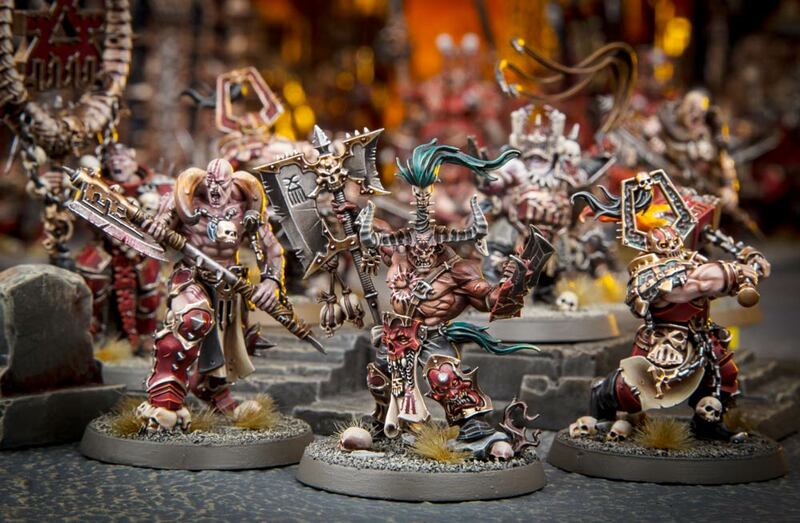 As it happens, I’ve only pre-ordered the Codex, and two of the character models: the Nexos, and the Clamavus. I really fancy that Locus model, too, but I really want to see how the army looks once I have the book in my hands before I go down the route of buying new stuff. I want to think about my list, to think about the models that I already have, and how the new stuff might fit alongside that. Of course, I’ve been aware of the youtube reviews already doing the rounds, and spent a couple of hours the other day listening to my usual go-to Striking Scorpion 82 and his review, but nothing quite beats having the book to look through yourself, I feel! I mean, I’m sure I’ll get some bikers, and I do want to get the new Ridgerunner, but I’m trying to temper my enthusiasm, because all too often in the past, I’ve found myself throwing money at a project to then get burnt out by it. Most recently, this has happened with the Deepkin stuff. While hardly new, it was still a new project for me, and I’d thrown quite a bit of money at it over the last couple of months, but ultimately I’ve just found it really difficult to put together an actual army list that I would want to play, after spending a long time looking through the battletome. I’ve never really experienced something quite as disappointing as that in the hobby before – the miniatures are incredible, and I really wanted to get painting up some wet elves, but when it came to it, my lack of enthusiasm for the army’s rules really just put me off painting them. I suppose actually having played some Age of Sigmar has helped, as I can appreciate that, actually, I enjoy playing Nighthaunt now, and I’m looking forward to building more on that side of things. Unlike with 40k, where I’m finding the variety of armies quite refreshing, and often find myself spurred on by having so many varied projects on the go, with AoS it’s a different matter, and I only really want one army. Well, I suppose that’s not entirely true, as the arrival of the Skaven on the scene has prompted me to return to a plan from a long time ago, and actually get round to painting some of the little rat-men. For a long time now, I’ve been thinking about getting myself an “old world” army that I could use in AoS. Back in September, I thought that would be the Beastmen, but in the five months since that initial flurry, I’ve only built up ten Bestigors and have failed to anything with them. Time for a change? I think so. There’s just something about the Skaven, though, that I quite like. While I did find them a little annoying in Rise of the Horned Rat – the only Warhammer novel that I’ve read that featured them – I do actually think of that book as one of the most enjoyable that I’ve read, and have been thinking a lot about re-reading it. While I don’t particularly relish the thought of painting a horde army, I do have Thanquol and Boneripper somewhere, having picked them up during the End Times, and I could see myself building up an army of these chaps centred around the larger behemoth models. I think that could be a good starting point, at least!